When you picture the future of regional transportation in and around Golden, what do you see? That was the question we asked residents during two open houses in September. The City of Golden invited all residents to discuss transportation options and where you want us to focus our time and money in the future. About 150 Golden residents attended the open houses, hosted at Fossil Trace Golf Club and the Golden Community Center. It was an open forum with stations offering information and plenty of opportunities for people to submit their opinions on transportation issues. As a starting point, the City presented three options and asked attendees to pick their favorite, least favorite and then provide comments on sticky notes. Alternative #1 – Just Say No. The basic idea of the first alternative is that Golden should continue to actively oppose the Jefferson Parkway and other efforts to add development-generated traffic to SH 93 and US 6. Of those who voted, 20 liked this idea with comments such as “We have been involved too long to give up the fight now.” Twenty-eight people disliked this idea, commenting that “Seems like we are past this point already” and “This idea is risky without support.” All three options were also presented as a quick poll on the Golden Vision Community Forum. This option received 11 votes. Click here to read the pros and cons of the first alternative as offered by City Staff, and all the comments generated by those who attended the meetings. Alternative #2 – Quit Funding the Fight. The second alternative proposes that Golden should scale back its expensive opposition to the Jefferson Parkway, and move to a more reactive stance if future traffic increases or other projects in our area are proposed. There was an overwhelming amount of dislikes for this option. Only two people liked it, with one commenting “The money spent fighting this fight would have paid for the road! I don’t think it should be a toll road but must be built soon.” On the other side, 41 people posted their dislike with comments such as “Continue the fight, do not leave it to others to choose for us” and “Money spent to define what we want and what will be built is the best money spent.” All three options were also presented as a quick poll on the Golden Vision Community Forum. This option received 1 vote. Click here to read the pros and cons of the second alternative as offered by City Staff, and all the comments generated by those who attended the meetings. Alternative #3 – Fight for Golden in Negotiations. Alternative three essentially proposes that Golden should seek to be a partner/participant in any legitimate regional effort to implement transportation solutions that meet our Golden Vision 2030 values and goals, and also reasonable compromises on beltway-related issues. Six people disliked this idea, with comments such as “If compromise means tolled lanes through Golden, it is wrong” and “City Council needs to completely fight this.” Alternatively, 68 people liked this idea, commenting that “Golden should negotiate the BEST deal possible in all cases” and “Golden needs to have a say, but we need to consider the surrounding areas and how to draw them in rather than push them away in any plan.” All three options were also presented as a quick poll on the Golden Vision Community Forum. This option received 14 votes. Click here to read the pros and cons of the third alternative as offered by City Staff, and all the comments generated by those who attended the meetings. A quick poll, administered both at the Transportation Open House meetings and on the Golden Vision Community Forum, revealed that most participants drive on US 6 and SH 93 nine or more times a week, and feel that addressing current and future transportation needs along those roads is very important. When asked about funding options, an overwhelming majority said that a regional sales tax would be better than tolling. See the results of the poll and all the comments generated below. Residents were also invited to participate in a webinar online in early October. The webinar outlined these same options. 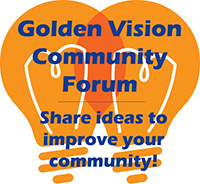 The entire list of comments from all the meetings and from the Golden Vision Online Forum was given to City Council for consideration in future decisions. The Council strives to be as transparent as possible in this process, and the City will make sure any actions will be presented to our residents for their feedback before action is taken. 1. How often on average do you drive on US 6 and SH 93 within or near Golden (please count one way trips)? 2. How important is it to you to address current and future transportation needs along US 6 and SH 93, assuming that any improvements would limit impacts on neighborhoods and meet Golden’s needs? 3. If a new revenue source for transportation improvements in Golden were needed, which of the following funding options would you most favor? Let Boulder residents fun their own highway. A regional sales tax would be an okay way to fund the highway, but it should encompass ALL METRO AREAS. Vehicle Registrations are high enough – don’t increase those, but a regional sales tax would be okay. These improvements should be paid for by the entire metro area, or at least an area far beyond Golden’s boundaries. For new revenue and to help with “other Golden Problems” utilize parking fees around the parks etc. for non-Golden residents! It is time for Golden to cut the best deal it can and move on. the deal that the city leaders were endorsing and recommending the city council approve over a year ago, as brokered by Gov Hickenlooper, was about as good as we can get so we should stop opposing this and plan for the inevitable before it gets done legislatively like the tower on top of lookout mountain when the greater good determined it was time to move forward for generations to come. The beltway is a bad transportation alternative. Highway 93 and Indiana should be improved instead. Those are the roads people need and the cost to improve them is far less. Golden should oppose the beltway and push for better transportation alternatives. Don’t back down. The last deal proposed fell far short of what Golden expects and deserves. The beltway does nothing to solve the real regional congestion/transportation issues. Also, interesting that the voting options appear to be mutually exclusive. I do not understand why Golden cannot continue to “actively oppose” the beltway and simultaneously “seek to be a partner . . .” in order to reach a solution that addresses congestion and preserves our community. Also, does anyone else object to the artistic depiction of a pastoral four-lane highway with an underground tunnel? If you need to attach a drawing to what is being proposed by CDOT, et al., make it a 65 mph six-lane highway splitting Golden in two. I know very few people who have heard that there is an active poll that may influence our leaders decisions for the beltway…hence only 19 votes from our entire population. I think it would be ridiculous to take the majority of this poll and go with it for deciding our future. To “close” this poll tomorrow would be unfair. You guys need to go door to door to get real input and votes.